Like a bad penny, we’re back after a week away due to BJ being ill, so we had a lot to cover. So much in fact, we went way long on the time for this show. But that’s ok, that just means you get some more to listen to, right? Oh, and we may let some spoilers fly too, so heads up! So in no particular order, here is a quick rundown of what we did talk about in this episode. 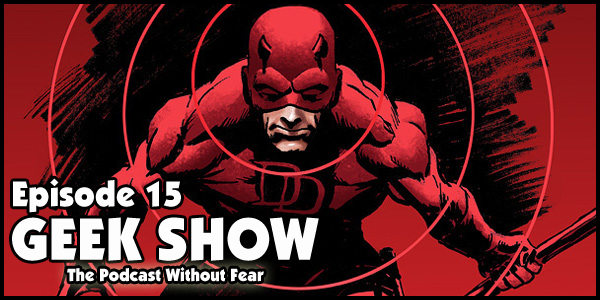 First off, we had to talk about the new Daredevil TV show on Netflix. We shared our thoughts on the show and the cast and the acting. Then we talked about Agents of SHIELD and some of the big reveals in the last episode, and the spin off show. We threw out a few ideas of what it could be about, but as the saying goes, we’ll just have to hurry up and wait. We also talked about the first full images of The Vision from Age of Ultron and why we are not seeing him in any of the clips of the movie that they have released. We also got into the new Ant-Man movie and some theories of why they went with an Older Hank Pym. We knew they didn’t want to do much with origins anymore at Marvel, because it kind of slows down the whole process. Plus, Marvel is making the assumption that fans are smart enough to know this stuff, and that new comers will go to the internet to look up more info. Might I suggest the Marvel wiki? We then got into some of the X-Men movie news on casting of the (Arc)Angel and some other topics associated with that, because Geeks want to know the things we are asking. And we also talked about the rumor of Ernie Hudson of Ghostbusters fame, being cast in the upcoming Black Panther movie. Then we got to some DC news and talked about Jason Todd, being in Batman v. Superman as Red Hood. And of course we talked about the leaked cam version of the trailer. BJ and I shared our thoughts on it. I’m curious if you guessed mine and BJ’s opinions on it. Let us know in the comments below. Now we come to the topping on the cake. BJ and I do a breakdown, clip by clip, scene by scene of the new Star Wars teaser trailer that debuted at Star Wars Celebration in Anaheim last weekend. Since the recording of this episode, we have gotten even more info that we’ll discuss in the next episode of Geek Show. But in the mean time, enjoy this one and give us your comments on the show. The more we hear from you, the better we can make the show. Posted on April 21, 2015, in Geek Show and tagged Black Panther, Daredevil, Ernie Hudson, netflix, Star Wars Episode VII, the Batman vs. Superman Trailer. Bookmark the permalink. Leave a comment.